Number 6 is being held hostage in “The Village” for only one reason: to answer the question why did he resign. But Number 6, who is a faithful servant to his former authorities and did not resign for personal gain – that is to say to sell the valuable information he has – but for personal reasons, rebels against his prison and is not willing to cooperate. Nevertheless his outward struggles against Number 2 and the whole establishment of the Village is no means to the end he seeks, namely to get his freedom back and escape. He has to understand that the answer to what imprisons him lies not with Number 1 but within himself. Throughout the essay Baudrillard’s theory of simulation shall be used to demonstrate that The Village is not a real, existing place but rather a simulation of Number 6’s own mind that shall help him to really resign from his job as a spy and force him to cope with imminent consequences concerning his new life. In the very first scene, we see Number 6 driving in an extravagant car on a long street. He is driving very fast, the look on his face is determined. Here he is free, he is bound to nothing. He can make his own decisions and he is going to make a big one. Next we see him driving through London, a place that, in contrast to the open road of before, clearly limits him and imposes boundaries that have to be respected. He finally seems to have reached his destination when he pulls into what seems to be an underground car park. In the next shot he opens a door with a sign “Way Out” on it and walks down a long narrow corridor. At its end he throws open another door and, clearly angry, resigns from his former employment by slamming a letter on the desk of another employee. When he is finally pulling out of the car park as a free man, another car is driving up right behind him taking up half of the picture. This car is following him home. If he is aware of it or not cannot be said for sure. Having arrived at home, Number 6 is packing his bags to go on holiday as soon as possible (he packs a picture of a beach maybe in the Caribbean). Out in front of the house a man clothed in black steps out of the car and makes his way to the door of Number 6’s house. Through the keyhole they spray in some kind of sleeping gas that immediately fills this whole house and Number 6 falls on his sofa, unconscious. When he wakes up he finds himself in The Village. The Village seems to be the complete opposite of the places Number 6 wanted to go to after his resignation. It has boundaries all around, the sea and the mountains which he is able to learn from a map of The Village. Even this map is extremely limited as it only shows The Village itself and nothing else. Also, individualistic thinking as well as freedom of speech and action are qualities that are frowned upon here. It seems that what the authorities of The Village want they will get in the end – “by hook or by crook.” And what they want is information. Information about why Number 6 resigned. Number 6 of course resigned for personal reasons – to achieve as he puts it himself “peace of mind.” That however is an answer that is obviously too simple for The Village authorities. Nevertheless for Number 6 it comes as no surprise that he has been imprisoned. It fits the black-and-white world view of a former spy. For him the only question is which side he has been kidnapped by – his own – to find out if he is going to give away their information under pressure, or the other side – to retrieve information from him. But here in The Village it is very hard to distinguish who is on whose side as well as who are the good and the bad guys; an issue specifically addressed in the episode “Checkmate” where Number 6 tries to find out who of The Village people is a guardian and who is a prisoner. Number 6 has to find out that he is now living in a Village that literally does not at all fit his black and white mindset as on a visual level it is extremely colorful itself. But Number 6 is a very determined man and has set his mind on finding out who Number 1 is. For Number 6, Number 1 is the key to everything and consequently to his freedom. He is of the opinion that reality and The Village exist next to each other – equal to each other. If he could only break out, he could go back to living his old life as always. For that reason he tries to break out several times but his struggles bring him nowhere than back to The Village in the end. In the episode “Many Happy Returns,” for instance, Number 6 manages to break out from a completely deserted Village by raft. In spite of going into hiding or accepting his freedom at last, his only aim is to return to London, a place that for Number 6 represents order and being in control. He visits his former house, drives in his old car and confronts his former authorities only to be back in The Village at the end of the day. Moreover, by falling back in his old routine he is apparently making the same mistakes that brought him to The Village in the first place over and over again. In fact, it seems that it is always this move to his former life that brings him back to The Village. But instead of thinking about what a non-possible breakout could mean in regard to the reality of The Village compared to the reality of the outer world, Number 6 decides to fight against The Village to the point of its destruction from within. Taking a closer look at The Village and its surroundings as Number 6 perceives them, they can be divided into three levels. The highest level is that of Number 2 and Number 1, the authorities of The Village. Their decisions and actions influence the behavior of the Villagers directly. Therefore the level of The Village shall be the second level right underneath the first one. Here the people of The Village live, seemingly oblivious as to what happens to them. Finally, for Number 6, there is another level that belongs to The Village structure. This is what he imagines to be his “old life reality” with him living in London, working as an agent and last but not least being free to make his own decisions. Number 6 believes that if he could only break out of The Village he would be back in his old reality, his old way of thinking and living which shall be represented by this last and lowest level. Nevertheless this level is elusive and hard to define as Number 6 never actually succeeds in reaching it in the course of the series. One could even have the impression that is does not exist at all. “Everywhere socialization is measured by the exposure to media messages. Whoever is underexposed to media is desocialized or virtually asocial.” — Stefan Hölting, “Ein Versuch die Theorien Jean Baudrillards für die Filmwissenschaft fruchtbar zu machen” (2009). In the very first episode, Number 6 destroys the radio because he cannot turn it off. If there is a radio or television broadcast in The Village, everyone has to listen to it – but Number 6 does not submit to that treatment. He is not influenced by the media as the other Villagers are. His behavior of excluding himself from the customs of The Village is not approved by the other citizens. At last in the episode “A Change of Mind,” Number 6 is convicted of being “unmutual” for his anti-social behavior. To make him believe that the community only has his best interest at heart and, of course, in the end to make him tell why he resigned, he must submit to a life-altering operation – “total social conversion.” During this procedure a doctor is going to disconnect the frontal lobes permanently which will bring Number 6 eternal peace of mind. In this episode in particular, as well as in the series as a whole, media plays an important role. There are different channels the authorities can use to give their orders and transmit their way of thinking to the people: Loudspeakers everywhere in The Village, the press, represented by The Village newspaper “Tally-Ho,” along with the radio and television that cannot be turned off but that one has to listen to. Surveillance is next to media the other main pillar The Village is built on and supported by. Surveillance helps to keep the Villagers inside their boundaries and to constitute Number 6’s belief that if he only managed to break out there would be something that he could connect with a “normal reality.” However, there shall be no focus on surveillance in this essay. Then again the use of media in “A Change of Mind” is significant as it creates an illusion. The life-altering operation of Number 6 is in the end only a trick which – supported by heavy drug taking – should make him believe that he has changed. Number 6, who does not feel different after the surgery, mentions his suspicions to another former unmutual citizen by asking him if he felt different. The other citizen only laughs, points at the puncture-like-scar on his forehead, and answers: “You should know.” The whole surgery was not only heavily publicized before, but even while it was performed being broadcasted on television so The Villagers could be sure of its success. Number 6, in contrast to the other Villagers, is the only one who understands that they have been deceived. Through the illusion created by the upper level (Number 1, 2…), and with the help of media usage and surveillance, all the Villagers apart from Number 6 are finally unable to distinguish between “reality” and a simulation. They are being manipulated by the media and the influence of the upper level to live an illusion – to play a role in front of a mere façade mirroring the ideas of reality. The paragraph above suggested that for most of the Villagers it is not possible to separate between what is real and what is simulated. A simulation is created in The Village through the use of media. But what if most of what the Villagers do, see and live is a simulation? Can there even be a reality behind that façade? The quotation at hand chosen by Baudrillard in his theories on Simulacra and Simulations from Ecclesiastes [not really] is put into context and made more accessible in Höltgen’s essay on Baudrillard’s Simulation theories: “Die Medien sind es, die die ‘Realität’ erschaffen, allein dadurch, dass sie sie disssimulieren und den Zuschauer glauben lassen, das durch sie Abgebildete existiere. […] die Simulation ist omnipräsent und die Macht ist im Gegenteil damit beschäftigt, diese Tatsache zu leugnen und eine Realität zu behaupten, zu ‘dissimulieren’. Die Macht ‘existiert demnach nur noch, um zu verschleiern, dass sie nicht mehr existiert. '” (Höltgen, 5) Using Baudrillard’s theory to understand the television series “The Prisoner,” this would lead to Number 1 and Number 2 only acting to obscure the fact that they themselves – or rather reality as a basis for The Village – does not exist. Baudrillard himself tries to explain, giving a simple example: A person can feign to be ill by pretending that he is. But someone who simulates being ill even actually shows some of the symptoms of that illness. “Thus, feigning or dissimulating leaves the reality principles intact: the difference is always clear, it is only masked; whereas simulation threatens the difference between ‘true’ and ‘false’, between ‘real’ and ‘imaginary’, since the simulator produces ‘true’ symptoms (…).” In connection to that theory can one go as far as comparing the simulation of the illness to a simulation of The Village as well as the symptoms of the illness to every action taking place there? Number 6 therefore would simulate living in his old reality and even produce some of the symptoms connected with his former life, namely the paranoid thinking pattern and the need to fight the enemy. 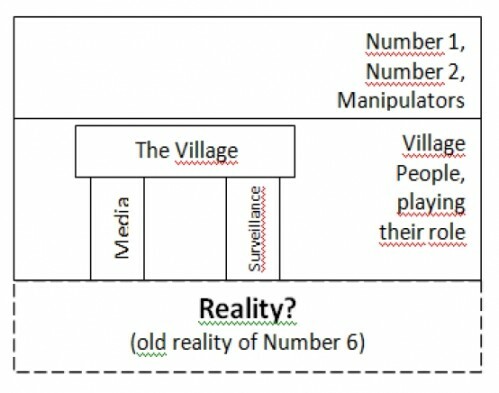 The Village as a whole therefore would only be a simulation of Number 6’s own mind that should help him understand that what he thinks is “reality” no longer exists. This is Number 6’s problem: he did not for a moment try to change his way of thinking after he resigned. However Baudrillard explains that this process of rethinking is necessary: “(…) mit dem Theorem der Simulation (müssen) die binären Oppositionen wahr/falsch, sinn/sinnlos, echt/gefälscht, real/imaginär, Original/Kopie oder Ursache/Wirkung einmal mehr überdacht werden.” That can be seen in his fighting actions against The Village – his enemy – wherein he constantly relates back to his former way of coping with situations only like a spy could do it: He always tries to break out and get back to his life before The Village. He tries to reach his former authorities to help him and to get to the bottom of this conspiracy. These actions are no means to an end but that is something he cannot understand. He is imprisoned in his own black-and-white mindset that shapes his perception as well as his way of thinking and he cannot get out – “there is no way out.” His “old reality” no longer exists as he resigned from his post as a spy to find a new and more peaceful way of living. However he does not know how to find and lead this new way of life. His first thought had been to flee the country, go on holiday and forget his past – to push it in a corner of his mind and hope that it would vanish somehow. Yet this would not bring him the peace he sought indefinitely. For leading a peaceful normal life a former spy would have to undergo serious change in his thinking pattern. Instead of abandoning his trained thinking methods of identifying conspiracies and recognizing traps set by the enemy, he thereof develops a kind of paranoid thinking the minute he gets out of the business. After all, it is he himself who is trying to hinder himself from escaping from his own decision to find peace of mind. Number 6 himself seems to be torn into two halves: One is still imprisoned in his old way of life and the other part is pursuing happiness and peace. This first part represented in The Village simulation as Number 1 tries to confront his antagonist (represented by Number 6) with the anxieties that come with the business. With this treatment, Number 1 tries to enforce the fact that Number 6 is coming to terms with himself and his past, that he can put it behind and start a new life. In other words, going back to the example of Baudrillard, one could conclude that the part represented by Number 1 is simulating The Village whereas the part represented by Number 6 has to cope with the symptoms of this Village reality. In the final episode, Number 6 gets his wish and finds out who Number 1 is, namely he himself. Number 6 has to understand that he tried to fight everyone instead of fighting himself. There really is no way out if one wants to get on with life – one has to cope with one’s past first. The last scene works as a link to the the opener but with the difference that this time Number 6 obviously left his old way of life behind on the desk with his notice of resignation. After his (this time) successful breakout, he reaches his car and the other black car that was formerly following him to his home and kidnapping him to get information is only a normal car now driving past his house. He recognizes it without suspicion. He looks straight ahead towards something that is out of the picture frame. Now he can get on with his life. Hölting, Stefan. 2009. “Ein Versuch die Theorien Jean Baudrillards für die Filmwissenschaft fruchtbar zu machen“ on http://www.simulationsraum.de/bibliografie/essays/simulationstheorie-und-film/ (accessed JAN/20/13). Baudrillard, Jean. “Simulacra and Simulation” in: Selected Writings. 1988. Ed. Mark Poster. Stanford: Stanford University Press. pp.166-184, accessed via http://www.stanford.edu/class/history34q/readings/Baudrillard/Baudrillard_Simulacra.html (accessed JAN/20/13). I really like this perspective, it’s something to think about. Especially I like that idea that No6 was trapped by his way of thinking. However, I’m not sure whether he really wanted escape back to his old life, and I don’t think that he eventually managed to break free at the end of Fall Out. One could also take this as a seemless link to the beginning, the last picture being the first one. Yes, more than one reading of the text is possible. That is true for any text. But I think that Caroline’s essay is perhaps the most brilliant reading of “The Prisoner” that has been written or published. And her use of Baudrillard’s simulation theory is a brilliant academic accomplishment in the unusual yet important area of Baudrillard and psychoanalysis. I surely didn’t want to deny the texts value, it is a very interesting and valuable reading!